Brad has been a practicing RMT for the past 8 years and loves the world of sport therapy and rehabilitation. His practice is mainly focused on myofascial release technique and deep tissue work. As a competitive swimmer and triathlete, he understands the value of preventative care and maintenance that the human body often needs. His approach to treatment involves educating patients in regards to faulty movement patterns which place additional strain on the human body. His treatments demand the patient be active in their therapy and relies on testing and retesting to measure change made by manual therapy. 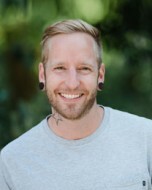 Brad also teaches at the Vancouver College of Massage Therapy and enjoys passing along knowledge to both his clients and new students in the field. He was awarded best RMT by the West Ender in 2017 and got a bronze in 2016 for his work in downtown Vancouver. He hopes to build a strong reputation in Squamish and is excited about getting involved in the community. Brad has also taken courses in Kinesio taping and more advanced MFR (myofascial release) techniques and regularly takes course to gain more tools to assist his patients in recovering quickly.